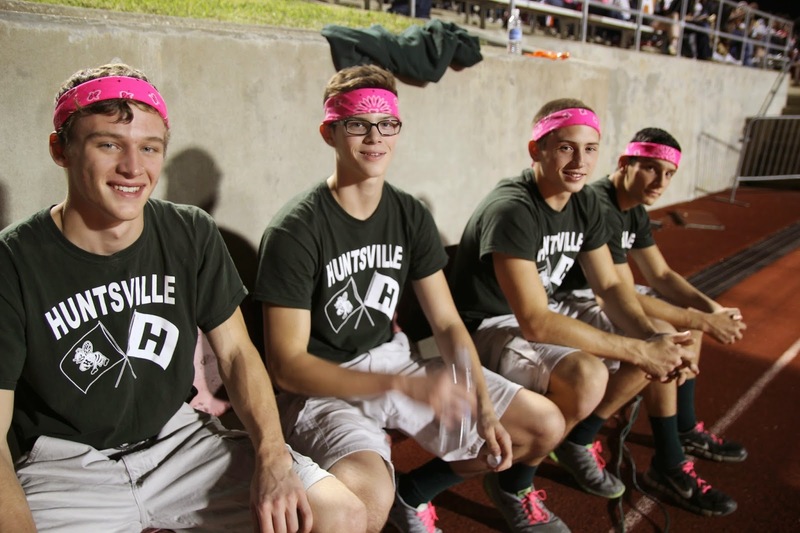 The H Factor: Huntsville's Homecoming- A Fall Tradition! 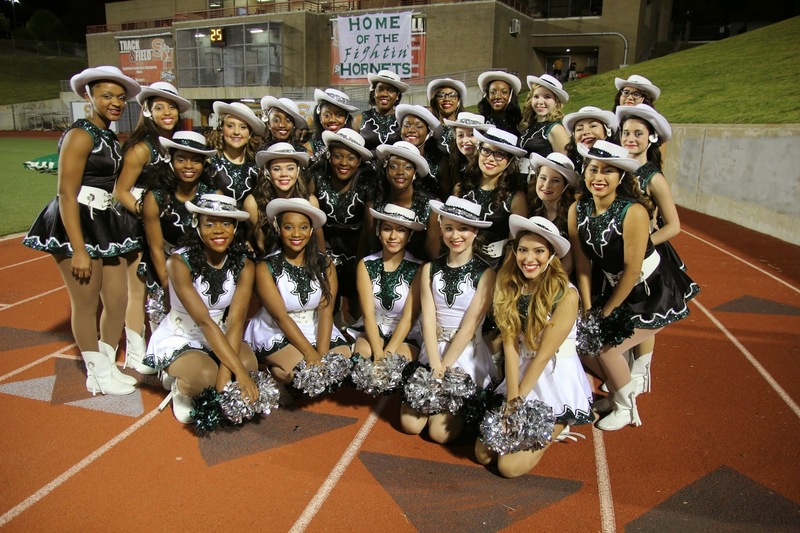 Huntsville's Homecoming- A Fall Tradition! We can't believe it's already been over a week since Homecoming! Since Homecoming, both our Varsity Volleyball and Football teams have additional wins under their belts, and the decorations have come down from the dance. Most thoughts are now focused on school, the rest of the seasons and (of course!) the upcoming Thanksgiving and Christmas breaks. She's got Hornet Spirit- it's written all over her face!! Homecoming 2014 ("The Day") is definitely gone, and Homecoming 2014 ("The Memory") is settling in. A man, his green wig and his bucket. So we hope you are OK with indulging us as we share lots of photos, because we would feel remiss if we did not share these shots from that wonderful Friday. Our coverage begins at our pep rally at the high school, includes the varsity games, the homecoming crowning, a special salute to breast cancer survivors, and of course the dance. Lady Hornet Basketball players representing. Soon it will be their turn!! First game is in Madisonville on November 11th. By the way, our new student-created HHS website, www.huntsvillehive.com, has a slideshow on its front page featuring over 150 student centered photos, including lots of pics from the dance. Huntsville Band Members Bring the Jams, and the Pose! Mrs. Lesikar is getting this party started! It might get loud in here! Those sparkly smiles match their hair bands! Coach Evans gets the crowd pumped for the Lady Hornet Volleyball Team! As you already know, Huntsville Seniors Perla Escott and Chijindu Diokpa were crowned Queen and King of Homecoming. Introducing our New Queen and King! Freshman Prince and Princess Nathan Shirley and Monica Cardenas. Sophomore Prince Kavon Parrish and Princess Shy'Diah Franklin. Junior Prince Jay Griffin and Princess Taylore Hartman. Senior Prince Morie Evans and Godmother Heather Earl. Senior Prince Fabian Barahona with parents Yolanda and Will Barahona. Senior Princess Allie Nichols with parents Nolan and Leslie Nichols. Senior Princess McKayla Chamberlain with parents Kasie and Steven Kroll. Senior Prince Chijindu Diokpa with mom Ugochi and sister Treasure. Senior Princess Perla Escott with parents Hortencia and Hector Escott. Senior Prince Jared Shirley with parents Sherry and Stacey Shirley. Makayla Doyle with mom Joanne Doyle. The Lady Hornet Volleyball team beat Bryan-Rudder in five games. It was tense, and the team demonstrated grit and a remarkable ability to finish strong. This team sticks together to win together. Definition of Concentration? See above photo. We got this- keep going!! No, you don't. Not here, not now. Then it was time for the Huntsville Hornet Varsity Football team to take the field. Our Hornets took care of business, beating Bryan-Rudder decisively, 34-10. The Team Lines Up for the Star Spangled Banner. but to honor the survivors of breast cancer. The Fabulous Grenadier Guard in full effect! Mariah Sanders came home to hang with Buzzy and the cheer team on the sidelines. Cancer Survivors and Huntsville Hornets Linda Marshall and Sophia Mills were honored during halftime. Just your typical Huntsville couple!! Flag team is in the house. See you later- I'm needed down field with this ball! Ms. Castro has her mum, do you? Cheer team and Flagmen get down after a touch down. The Famous Scott Bumbaugh Caught in his Infamous Huntsville Hornet Boogie! He's a German Teacher to Many and a Hero to All!! Oh man, you got to keep pushing, Flagman! Oh baby, we love your mum! She got here early to start celebrating! Hornets back from A&M for Homecoming Weekend. Now the drummers and the saxophones! Taking a quick break in the stands. I'm sorry, did you say 'mum'?!?! In the Spirit, Rocking a Pink Feather Faux Hawk. After the game, students headed to Huntsville High School for a victory dance. Remember to check out those student photos on www.huntsvillehive.com . Each HHS organization contributed a banner for decorations. Mrs. Godby, Homecoming Sponsor Extraordinaire! Mrs. Herrington is a friendly ticket lady and bouncer! Principal Beth Burt and her date. Teachers, Chaperones and Husband & Wife- the Jeffcoats! Wow! Fantastic job with beautiful photos and cleaver cut lines that make me feel like I was there...oh wait, I was! But, the write up and photos are amazing! Proud to be a Hornet! We Salute our Huntsville ISD Veterans!